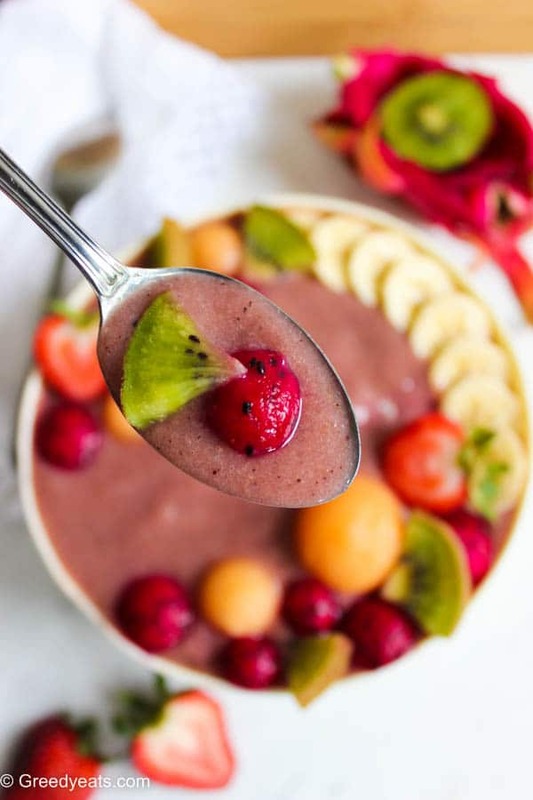 Ripen strawberries and juicy kiwis come together in this delicious and health packed smoothie bowl recipe! My heart is drawn only towards strawberries during summer. 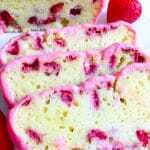 Sweet, ripen and and juicy strawberries. 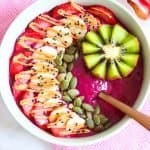 I am also lost in the bites of this smooth textured smoothie bowl recipe. 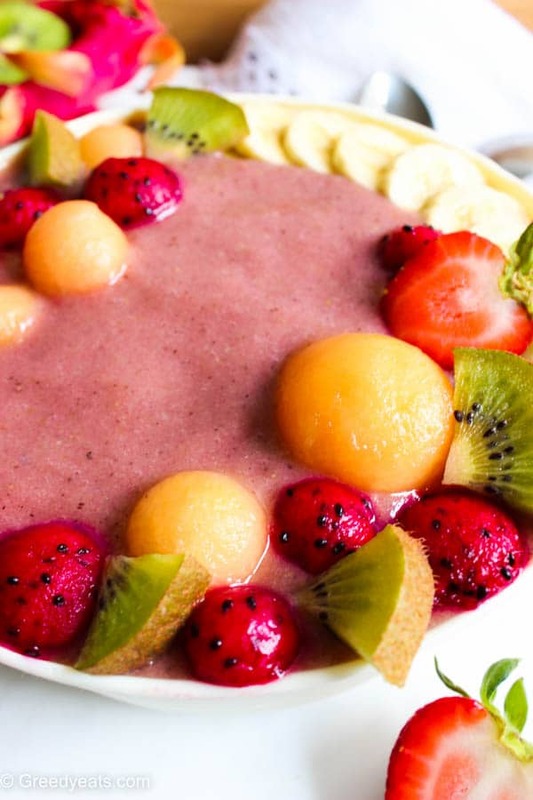 A smoothie bowl that features sweet little crowning jewel like toppings. These days I am a little bored with smoothies that are smooth to taste. Before you call me deranged, hear me out! I mean take a moment to think about it. Why on earth were smoothie bowls made in the first place? To add delicious contrast and bite to that smooth textured smoothie! No? You can pretty much add any fruits of choice. Or whichever are available on hand. I highly recommend scooping cantaloupe/muskmelon and dragon fruit balls. They make for a nice contrasting topping. Plus hail to all the nutrition they pack in! And these are very easy to make. Use a metallic tablespoon and teaspoon to do so. It will be easy to penetrate in the fruit. Run it in your thick fleshed fruit just like you would to scoop ice cream. So darn simple. I so believe we eat with our eyes first. And don’t pretty looking smoothie bowls like this tastes more delicious? Speaking of pretty bowls, you need to check this one out. This recipe is so versatile. A few simple and available at ease fruits and some almond milk. Now you can pretty much use any dairy/nondairy milk you like here. I find almond milk tastes so good with this particular smoothie. Also you can use fresh/ frozen fruits as available at your end. Blend in a few ice cubes if using fresh fruits. Or you can quickly chill your smoothie bowl for 10-15 minutes in the freezer! I did not use any sweeteners in the recipe. As banana and strawberries were sweet enough for my palate. Feel free to use honey, agave or even maple syrup to make the smoothie sweeter! Lets get that blender running. 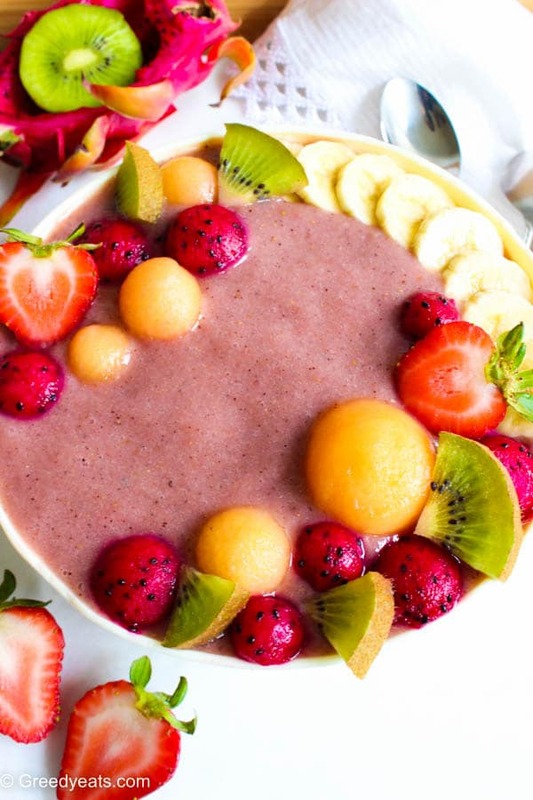 And give a clean+fresh start to your day with this almost pink smoothie bowl! Also try my summery overnight oats recipe with mango and berries! So fresh and indulgent. 1. Roughly chop and add all your ingredients to a blender. 2. Blend all the smoothie ingredients together until smooth. 3. 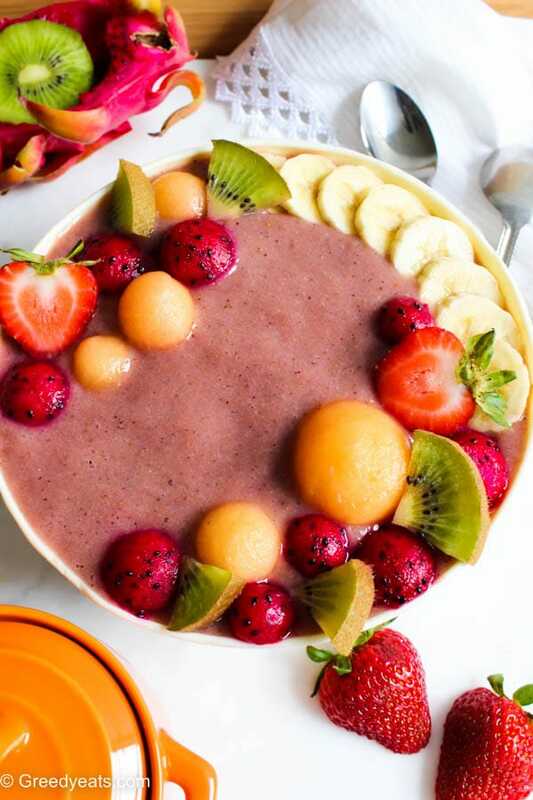 Pour in a bowl and top/decorate with fresh fruit toppings of choice. 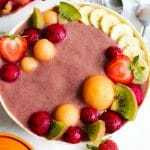 If using fresh fruits for smoothie, either chill the smoothie bowl for some time before serving or add a few ice cubes while blending. You have been in the smoothie mood, haven’t you? This is another beautiful creation, Neha. Perfect for the summer! Thanks! I love strawberry season! So many things to do with them from smoothies to just eating them raw to pies. Yum and so so beautiful! They are my fave too. Thanks Laura! So happy to hear you loved it Neil! Thanks for a wonderful comment! 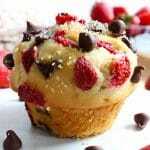 Everything with strawberries if perfect for me ! Thank you !